At Dawson Springs, Ky. take RTE #109 South for 6.1 miles. Turn right onto RTE #398(Bainbridge Road). 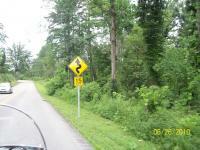 Its 8.4 miles to the intersection of Ky RTE #91(Princeton RD). At this intersection, you have 2 choices. Turn right towards Princeton. Turn left towards Hopkinsville. I turned left(south on RTE #91 for 4.1 miles then right onto RTE #624 to Cerleaun, then onto RTE #124 to Cadiz, Ky. Lots of good scenery and curves. Lots of farmland and hills. beautiful scenery. On top of one hill, can see for a very long ways. Lots of very twisted turns as it starts out. Then goes to lots of turns, up and down hills. Just a good country backroad. Have to watch for gravel in the road as there are several gravel driveways. And watch(drive slow)on some hills and curves. Can't see where the road goes, going over hills and curves. Nothing on this road but beautiful scenery. There is a very few places to pull over to take in the view.